When your little Frozen fans ask for Olaf pumpkins this year, we thought you might like to add some “snowflake” pumpkins to your Disney-themed Halloween decorations. 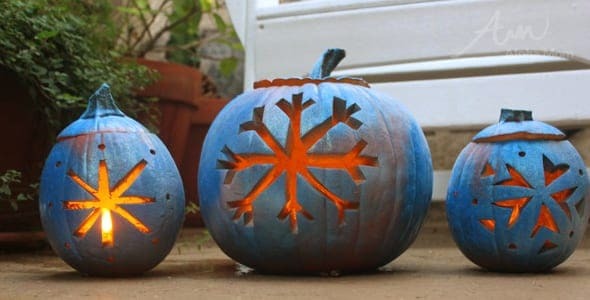 Snowflakes are pretty easy to carve on a pumpkin and with some added glittery spray paint they are extra glow-tastic! Snowflakes can be pretty easy to draw. Draw an asterisk and then some arrow tail off each end. Add dots with a screw driver or drill if you like. You can make it as elaborate or as simple as you like. Just try to keep everything generally symmetrical. Unlike nature you don’t have to get every line perfect. After you’ve carved your pumpkin (Don’t worry about staying in the lines because you will spray paint over them later) and removed any stray strands from inside, you’re ready to paint! Take your pumpkin outside into a well-ventilated area and give it a quick once over with one color. I used three different shades of blue and white and let them marble a bit. You can even add glitter before the paint dries for an extra sparkly effect. When the paint has dried you are ready to put a battery-operated candle inside and watch your snowflake jack o’lantern glow! Appropriate Age levels: Teens to adults. Leave the carving and spray-painting to responsible adults who know how to be use proper precautions. ** Always paint outside or in a very well-ventilated area.